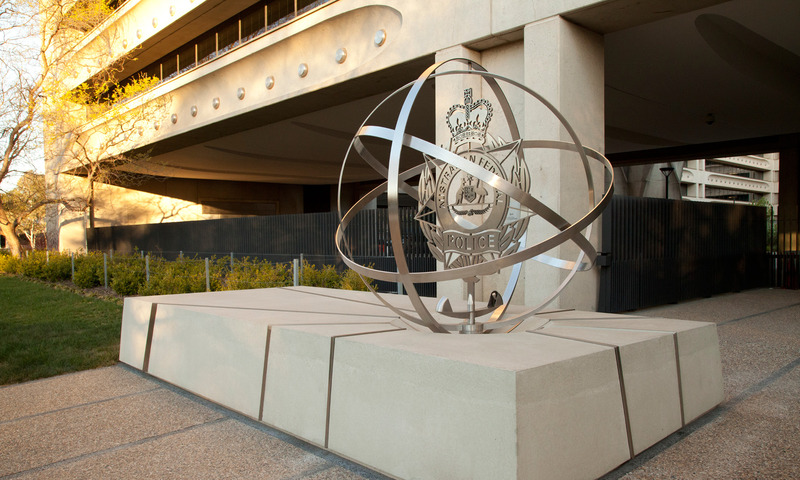 The AFP Globe project was a full design and engineering project for the Australian Federal Police. Thylacine designed a new signage element that could be used as a national symbol for both the AFP’s new National Headquarters building and as a media icon to symbolise unity and service to the nation. The work consists of two elements; a precast concrete plinth and a mechanised stainless steel sculpture that has counter rotating orbs surrounding a sculpture of the AFP’s crest. These elements marry through the complex yet elegant unity of mechanical engineering, electronic control and robust sculptural form. The twin offset counter rotating orbs revolve around a central shaft that holds the stainless steel crest static. The forms appear to fold and twist around the stationary crest; this is further enhanced through illumination creating a dramatic shadow of the sculpture and its surrounds. The mechanisms and design that drive the counter rotating orbs allow high technology to be interfaced to the sculpture allowing safe and stable use of the sculpture in the long term. These elements utilise dynamic mechanics that tie with sensors to monitor climatic variation, physical forces and traffic proximity to react to any changes as required. This mechanical synergy was carefully designed, engineered and prototyped with animations, full scale mock-ups and working mechanical models. The sculpture has been a success in providing a highly visible symbol for the service that the AFP deliver to Canberra and the nation.